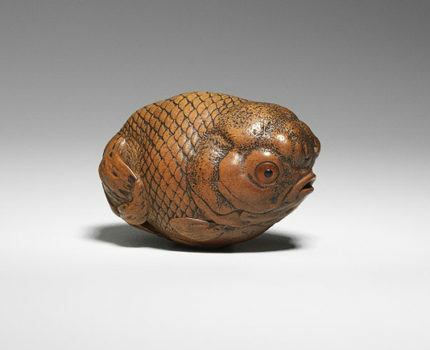 Goldfish netsuke. Made by Masanao I of Ise, Japan, early 1800s. This display features a selection of delightfully detailed netsuke and other traditional Japanese male accessories. Step into Edo, one of the biggest cities in the world in the 18th century – now modern-day Tokyo. Discover the art of Japanese male fashion in this sophisticated urban centre, where men wore fashionable garments and carefully chosen accessories to demonstrate their status and personal style. Netsuke (pronounced net-ské) are intricately carved toggles that were worn by Japanese men during the Edo period (1615–1868) to prevent dangling items (sagemono), hanging from a sash (obi) tied around a kimono, from falling to the ground. 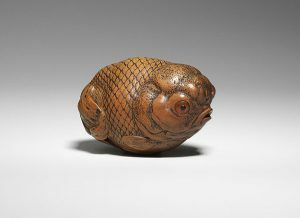 Netsuke were used by all classes of society, but in particular by merchants who wanted to demonstrate their wealth and taste. Much like European fob watches and cufflinks they revealed the sartorial taste of the wearer. 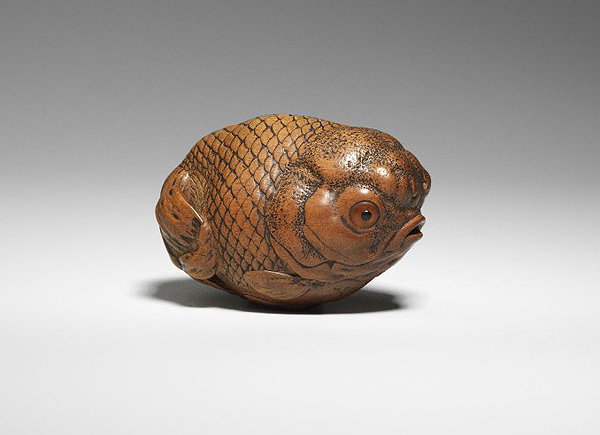 Netsuke come in a variety of forms and materials such as wood, ivory and porcelain, and are now highly collectible. Netsuke are often displayed as miniature sculptures, but this display will show how they were worn as part of a complete outfit. Apart from a group of some of the Museum’s most stunning netsuke, a bespoke kimono, an inro (a case for holding small objects), a sword, and smoking accessories will also be on display. * The display will open at midday on 19 June, it will open at 10am on every other day.